Admittedly, I can’t understand a lick of what this reporter is saying, but the gist is pretty much that a cross-eyed possum named Heidi has taken gay blogs and Germany by storm. Either that, or Heidi Montag just cannot stop with the plastic surgery. Heidi has become a regular evening news fixture, the face of a stuffed animal line, and has even had rock bands write songs about her. You go girl. She even has multiple Facebook pages. 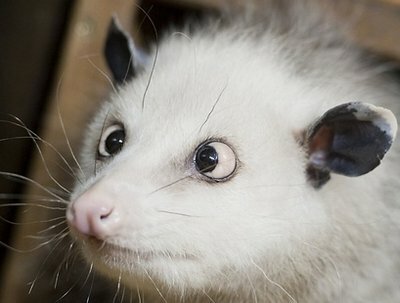 This possum is officially more successful than most people will ever be. There’s a lesson to be learned here somewhere about how being different is what makes you special. But we can’t seem to focus (zing!) on any morals while gazing into those wonky possum pools. Skip ahead to the 25 second mark and see what all the fuss is about. But be careful not to look directly into her eyes, or she’ll eat your soul.